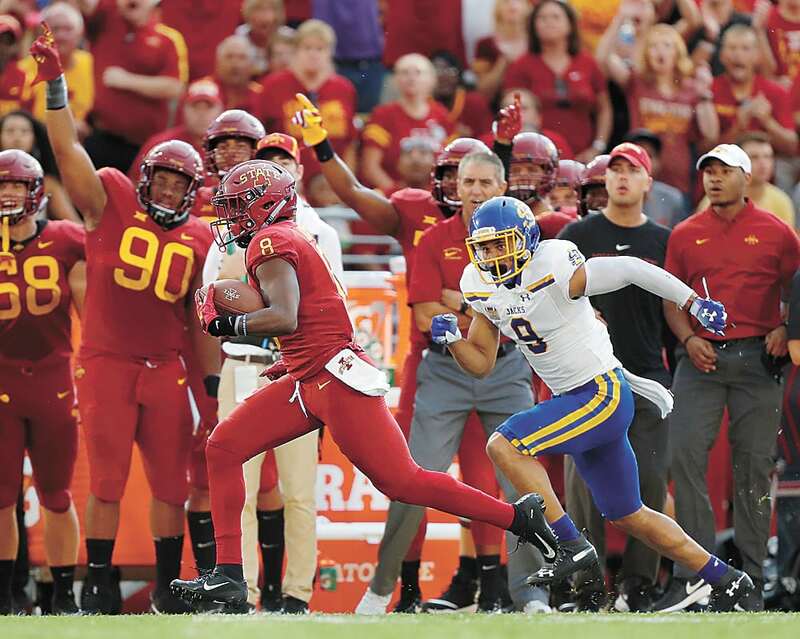 AP PHOTO - Iowa State wide receiver Deshaunte Jones, left, breaks away from South Dakota State cornerback Jordan Brown for a touchdown during Saturday’s college football game in Ames. AMES — Iowa State football’s season opener lasted only a little more than four minutes. 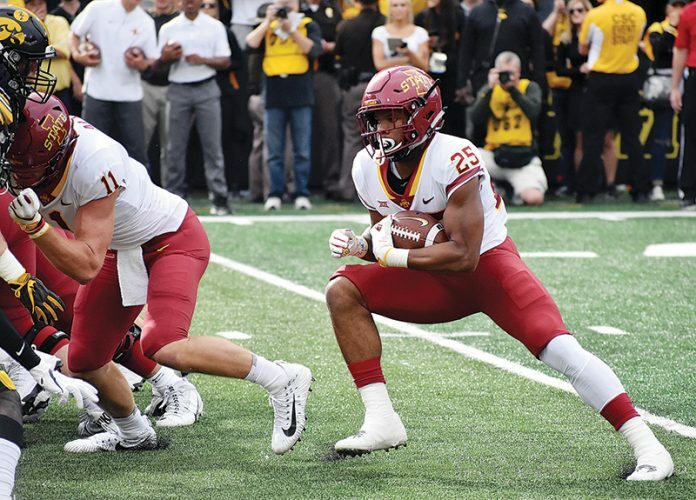 The Cyclones opened their season against South Dakota State Saturday at Jack Trice Stadium, but inclement weather spoiled their plans for completing the game. Iowa State Athletics Director Jamie Pollard said the two teams will not be able to reschedule the game, but the Cyclones will look to get a game during their bye week or during championship week if they needed another win for a bowl. The Cyclones quickly got on the scoreboard during their first offensive drive of the game, but the lightning delay sent both teams to the locker room shortly after. The delay started just after 7:15 p.m. and they announced at 9:45 p.m. that the game was cancelled. The last cancellation was in 1963. Seven of Iowa State’s players were suspended coming into the game. Pollard said that the game will count for those who were required to serve one game suspensions. South Dakota State will still be paid for the game, Pollard said. 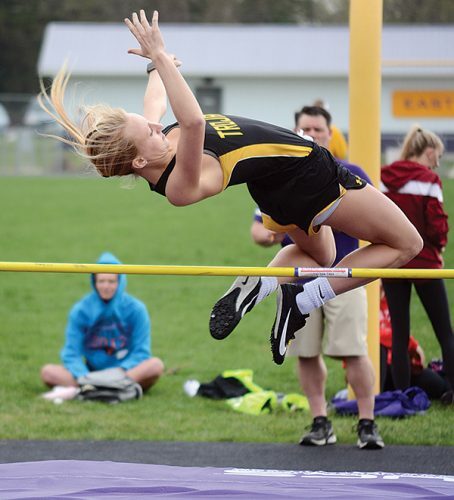 The game was ultimately called because both team’s coaches felt it was the best decision. They didn’t consider the option of playing Sunday because the weather outlook isn’t great and logistics would have been difficult, Pollard said. Iowa State came into the game off its best season in years, capped with a Liberty Bowl win and two top 5 wins. This is Matt Campbell’s third season as head coach for the Cyclones. With all the hype for the season, Pollard said the cancellation was disappointing, especially with the crowd turnout. Pollard didn’t have immediate information about ticket refunds right after the game, but said it would partially depend if Iowa State got another game on its schedule.